Discussion in 'Fan Zone' started by ShortRound131, Apr 17, 2019. "Was i really that bad at on MNF, Zeke??". lwehlers, Pantone282C, Techsass and 4 others like this. If I'd had that toupee, I would have been awesome. beware_d-ware, Roadtrip635, gmb1 and 2 others like this. Your hair looks so funny that I shaved my head. How many Garretts does it take to change a lightbulb Zeke? Pantone282C, JBond and jazzcat22 like this. Can I borrow some of that hair? Pantone282C, Zordon, ItzKelz and 2 others like this. JBond, Tangle_Foot and jazzcat22 like this. Witten: "Yeah that was my real hair on MNF!" Pantone282C and Techsass like this. Pantone282C, maryquality and ShortRound131 like this. Jason...With my head shaved I can get that extra 1/2 yard for the 1st downs now. Zeke....yeah with my hair, I will get you the first 9 1/2 yards. Pantone282C, BigStar, maryquality and 2 others like this. There seems to be a trend here. Poor Witten. Pantone282C, DallasEast, conner01 and 2 others like this. Post of the day. Mods, feel free to close this thread. Longboysfan and Silver N Blue like this. "Makes sure you schedule those private meetings with your QB to keep your stats up. It may hinder the team in the long run, but you and Dak will get that money. Oh yeah, don't tell Cooper, he's the scaepgoat." I'm back because the wifey kept saying, "Feed me" too. So Jason, is it true, when you first came into the league, you played with leather helmets and no facemasks? DallasEast, Tangle_Foot, Boyzmamacita and 1 other person like this. 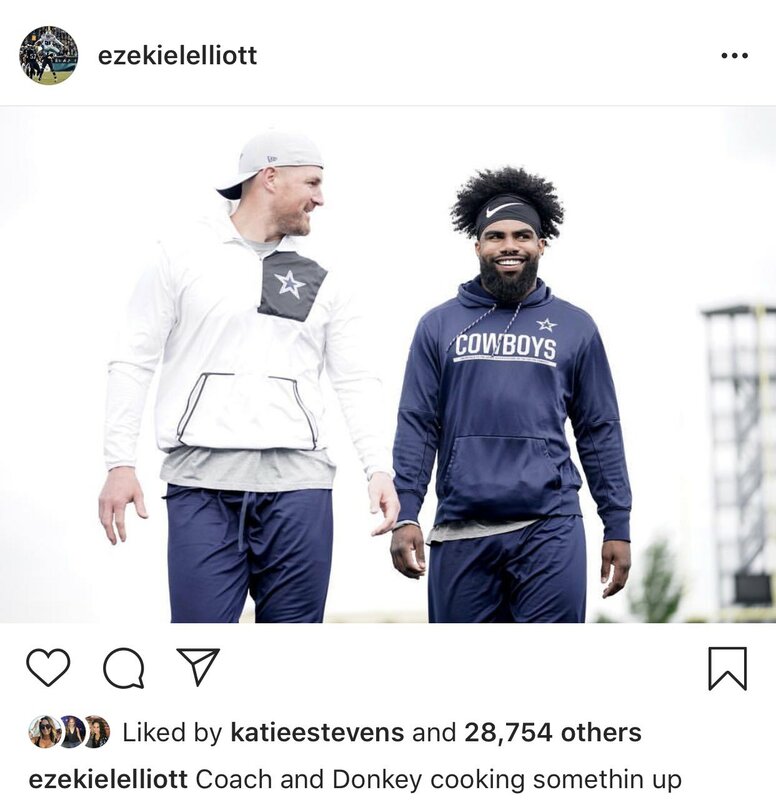 Hey Zeke, been to any parades lately? Zeke: At least I have hair.